Driving with a beer ... and kids int eh car? We know that's wrong. Should we view mobile phone use the same way? The AAA auto club is rolling out a safe-driving campaign aimed at people who text on their phones while behind the wheel. It comes the same week as a Syracuse driver was killed by a distracted driver. The problem is more prevalent – and deadly – than you might think. WAER's Chris Bolt explores the importance of AAA's new safe driving campaign. Triple-A of Western and Central New York has found most people think driving while texting is dangerous – 90 % rated it a serious threat. But spokesperson Lindsay Kensy says it doesn’t’ stop them. Their starting a media campaign called “Intexticated” – driving. The P-S-A for T-V and social media shows a driver with children in the car driving … with a beer in his hand. 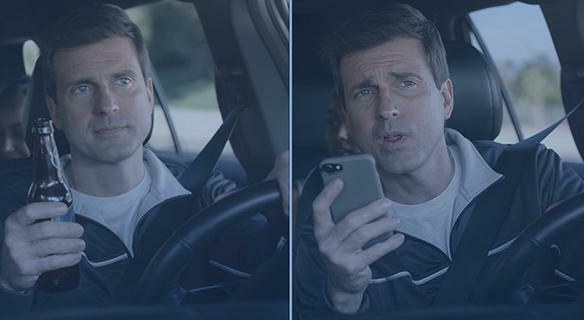 It’s trying to make the point that texting-while-driving it’s just as dangerous as drinking and driving. “So we’re really trying to make distracted driving as social unacceptable as drinking and driving is,” said Kensy. She says Bluetooth or voice texting might be a bit better – but is still shown to be a distraction, especially when you look away from the road. Kensy recommends putting the cell phone away, maybe not connecting to on-screen functions, and to pull over if you have to text or make a call. Passengers can help by sending any message or using the navigation so the driver doesn’t have to check it. And from home, you can try not to call or text someone who you know is driving. AAA says 9 people are killed every day, on average, in crashes caused by distracted driving. The messages come at a time when Central New York knows all too well the dangers. An Onondaga Hill accident this past week saw a woman killed when authorities say a driver was checking an electronic map and drifted into a head-on collision. AAA PSA (Dad) from Doug Shupe on Vimeo. The “Don’t Drive Intoxicated – Don’t Drive Intexticated” campaign rolls out this week. The Upstate Trauma Center in Syracuse introduced employees to its new virtual driving simulator today ahead of the busy summer driving season. The simulator is unique because drivers get to sit in an actual car and allows people to move the steering wheel. The front tires of the car rest on elevated platforms with high tech sensors capturing the movement. Trauma Outreach Coordinator Jerry Morrison prepares drivers before they take a virtual spin. A new AAA report shows that nearly 4,000 tickets were issued to motorists in Onondaga County in 2015 for using their cell phones and texting while driving. Legislative analyst and report author Alex Slatky called the situation ‘an epidemic’ and said people need to be more aware of the severity of distracted driving. More than four out of five drivers older than 65 in New York State have never talked with anyone about increasing risks of traffic accidents as they age. A new AAA of Western and Central New York study has implications for safety on the roads due to more older drivers. WAER's Chris Bolt reports on the new study from Triple A of Western and Central New York.